It's always nice when friends drop by. While my sweet friend was sitting at my breakfast bar just visiting with me this week, I made a variation of Miz Helen's Cranberry Sausage Cookies. This was a new-to-me recipe and we liked them a lot although we thought they were decidedly more similar to drop biscuits than cookies, but that may have been because of my chosen cooking method. Here is the basic recipe adapted from Miz Helen's Country Cottage with some variation ideas. Put all dry ingredients in your mixer's bowl and give it a whirl a time or two just to mix ingredients. Then put the butter in the mixer with the dry ingredients and turn it on medium so that the butter gets "cut" into the mixture. Pour in all other ingredients and mix until combined. It doesn't take long at all. Drop by ice cream scoopfuls onto a tray lined with parchment paper. Bake at 375F for 20 minutes or until golden brown. I have to admit that sausage in a cookie is too weird for me. 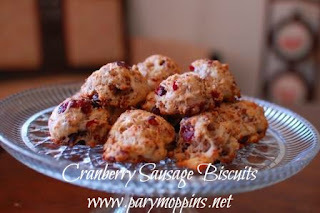 But dried cranberries in a biscuit with sausage sounds brilliant to me! This is very similar to the recipe I use for cheddar garlic biscuits. I would just need to add the sausage and cranberries. Glad you liked the recipe and it gave you new ideas, it is always fun to make a recipe your own. Thank you so much for sharing it at the table with Full Plate Thursday. Loved it Miz Helen! Thanks for the inspiration!